Plagued with malfunctions and delays, segment of new high-speed train linking Jerusalem to Ben Gurion Airport closed once again Tuesday. Four train departures on the new high-speed Jerusalem-Tel Aviv rail line were cancelled Tuesday morning Israel Railways announced, the latest in a string of malfunctions and technical delays that have plagued the line since its opening last month. The new train line was initially slated to open on March 30th, but was delayed after engineers warned of safety issues. 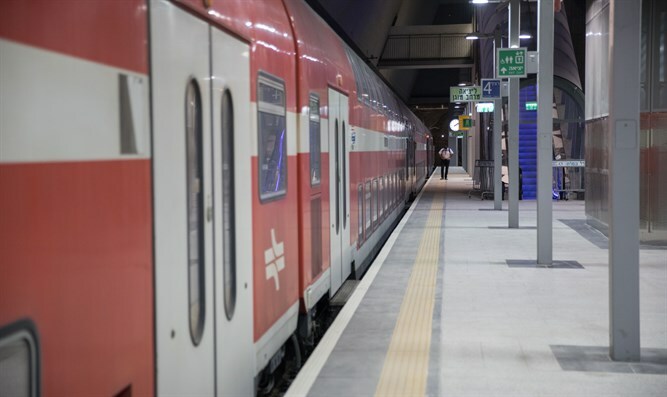 The high-speed rail line finally opened on September 25th, though only the Jerusalem-Ben Gurion segment – linking the capital with Israel’s largest international airport – is currently operational. Passengers heading to Tel Aviv must transfer at the airport. Problems have continued to plague the new line, however, even after it was opened to the public. Passengers have complained of extended delays and technical problems, including an hour-long delay for one train Monday en route to Jerusalem, which came to a halt inside a tunnel. On Sunday, a train was halted due to a power failure on the tracks. On Tuesday, Israel Railways announced the cancellation of four planned train departures scheduled for Tuesday morning. The company said the cancellations were caused by delays in work being performed by the Semi corporation on the new rail line. Israel Railways vowed that the train line would resume normal service after 7:30.